Exercise Equipment - Power Systems Dynamax Medicine Ball Burly 20 lb. > Exercise Equipment - Power Systems Dynamax Medicine Ball Burly 20 lb. The soft-shell construction and balanced, uniform weight of this ball make it easy to handle. It remains dimensionally stable and balanced while providing functional resistance during any fitness, sport, or rehabilitation exercise. Ideal for rotational movements, core exercises of many types and dynamic strength. Casing is sewn from 18 oz. flexible vinyl-coated polyester. Filler material provides even weight distribution and helps maintain shape. 14" diameter. Ball slamming is not recommended! The Dynamax Medicine Ball's design allows you to strike balls with arms and legs for more diverse training. Shell design and construction ensure that ball remains dimensionally stable and balanced. 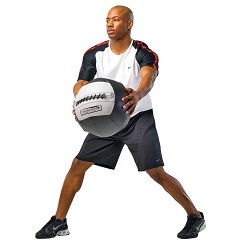 Competitive Edge Products, Inc. is an authorized distributor of the medicine ball. Fast Shipping: Orders for the Power Systems 24020 generally leave the warehouse within 1-2 business days.